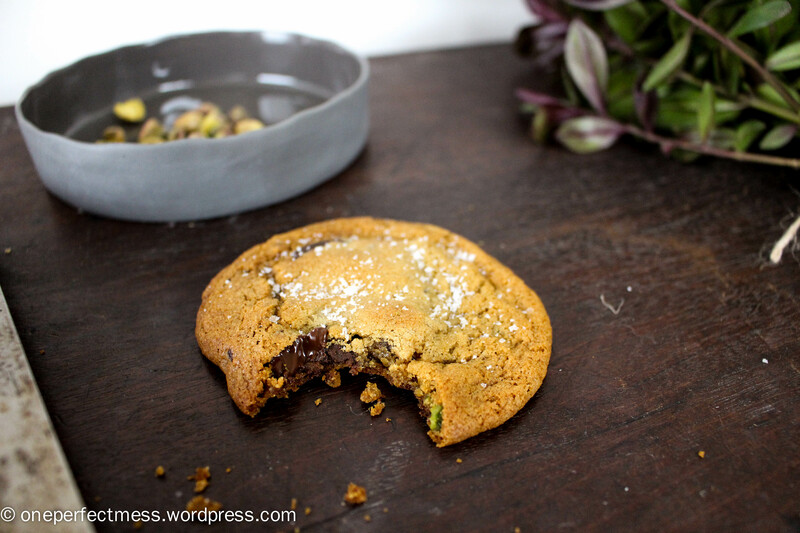 Fancy a batch of these pillowy-soft centred, crispy edged, slightly salted, honey-laced cookies? 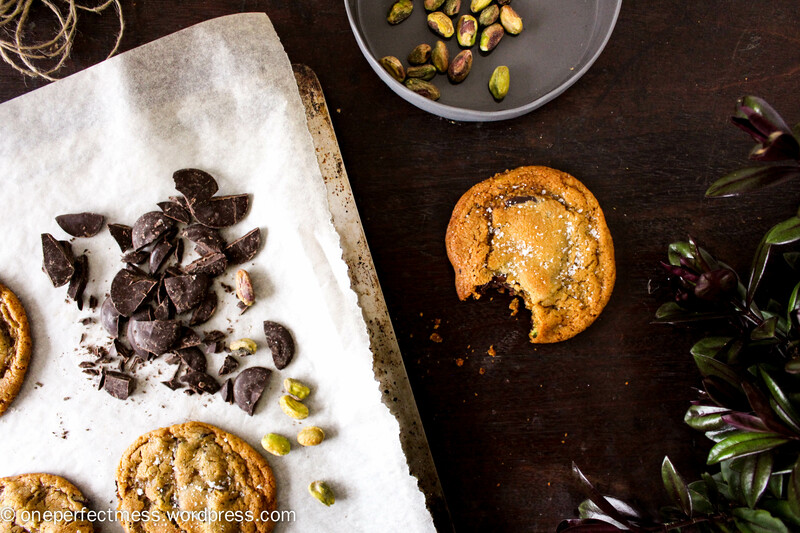 Packed with generous chunks of dark chocolate, crunchy pistachios and the promise of that perfect chewy texture, they’re a little exotic and utterly seductive. Perfect for late night snacking with a cup of tea, I used whole wheat flour for thicker cookies, and dark brown sugar for an almost caramel-like flavour. These devilish darlings don’t disappoint. Unfortunately last Friday, I was recklessly learning to skateboard and managed to dramatically tumble and break bones in my elbow and wrist. I’ve elegantly stumbled through life thus far without a single break, despite some rather rough accidents, but evidently I orchestrated this one so perfectly that I’m now plastered and slung and a little drowsy on painkillers! The novelty has worn off a bit and I’m starting to miss having two hands, but I’m lucky that it’s only a single limb and it’s only temporary. If you don’t mind, help me spread the story that I broke the arm whilst single-handedly stopping a bus that was headed for a box of oblivious little labrador puppies. Until I’m fully abled again, I’m allowing friends to act as sous-chefs so that I can create a few masterpieces in the coming weeks; keep your eyes peeled! Adios until then, enjoy your cookies and deck yourself out in elbow pads and helmets and flashing lights if you decide to skateboard. And if you fall down, do as my pal cleverly encouraged me to do; jump straight back on to prove that you’re stronger than your fear! Maybe just get an x-ray first. Beat the sugars and butter on medium speed for 8-10 minutes, until pale, creamy and thick. Scrape down the sides of the bowl with a spatula every few minutes. The mixture will reach a ‘wet sand’ stage first, but should end up looking like a tan-coloured whipped cream. Add the egg, vanilla and honey, and beat for another minute to combine. In a medium mixing bowl, sift together the flour, baking soda and salt. Turn the beater to low speed, and add the dry ingredients one spoonful at a time until combined. Scrape down the sides of the bowl, add the chocolate and pistachios, and beat again on very low speed for 30 seconds. Line 2 large baking trays with greaseproof paper. Roll the dough into golfball sized balls, place on the tray with about 5 cm of space around each cookie to allow for spreading, and refrigerate for 2 hours or overnight. If you don’t have enough time (or self-restraint, no shame), then bake the cookies straight away. Preheat the oven to 180°C/350°F fan-forced. If you refrigerated the cookies, place them on the freshly lined trays. 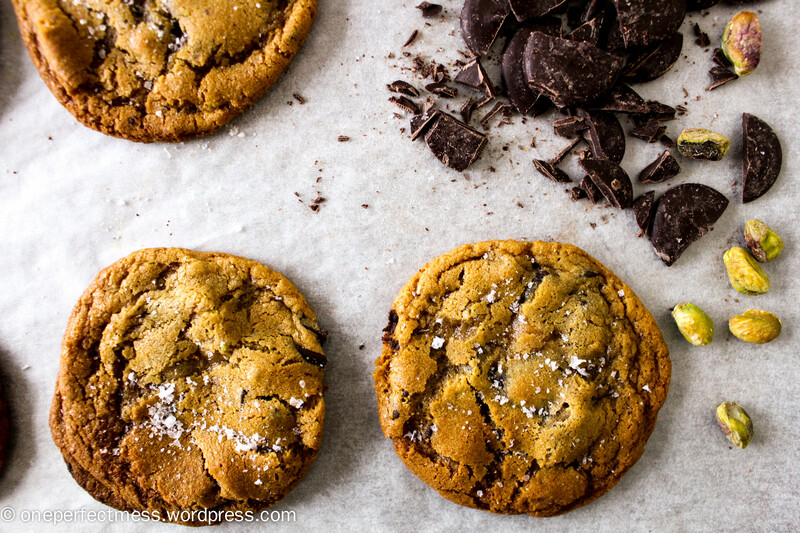 Sprinkle salt flakes on each cookie, and bake for 13 minutes from the fridge, or 10 minutes from room temperature. Leave the tray to cool on a wire rack for 15 minutes, then place the cookies directly on the wire rack and leave until just cool enough to eat! 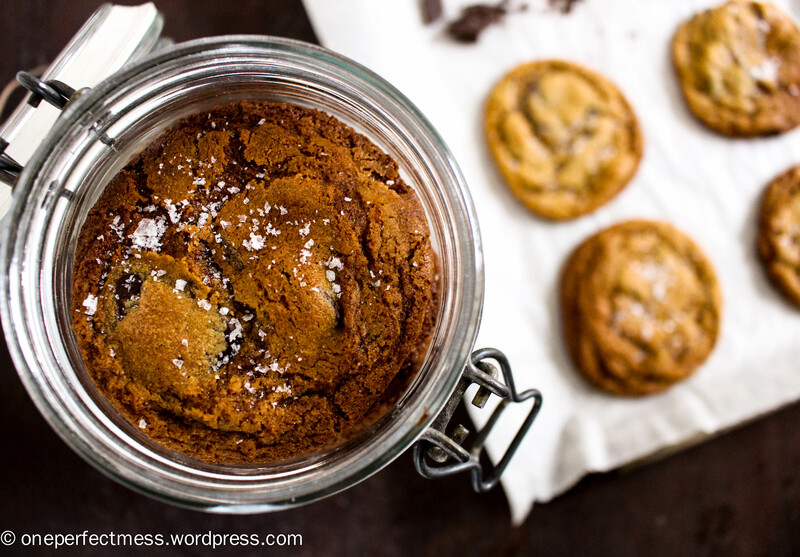 Store the cookies in an airtight container for up to 2 weeks. Hi Cecilia! So sorry for the late reply, I’ve been on holiday for a few weeks with no internet! Plain flour is the Australian name for all-purpose flour. The wholemeal plain flour is a less refined version of plain flour, you should be able to find it in the flour section of your supermarket 🙂 I find it makes the cookies a little softer and chewier, but if you can’t track it down just replace the wholemeal plain flour weight with extra regular plain flour. Happy baking! !